I thought I would be able to get so much done these three days. But Friday, souricette 2 had no school so I only got to sew during her nap. 45 minutes? Tops. She woke up really cranky and I settled on the couch and held her close. She slept 90 more minutes on me. No more sewing. 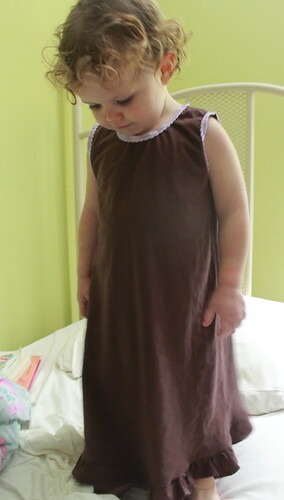 So all I managed to do is finish her second nightgown and cut out the material for the two skirts. The fabric is organic cotton jersey. It’s a bit stiff to be honest but the girls don’t seem to mind. Saturday, I thought I’d have more time. You know, leave the kids with daddy… But Mr. Mouse suggested we go to dinner. And we always leave early so we can walk around the city without kids in tow. And souricette 2 decided she needed to be with me in order to nap. 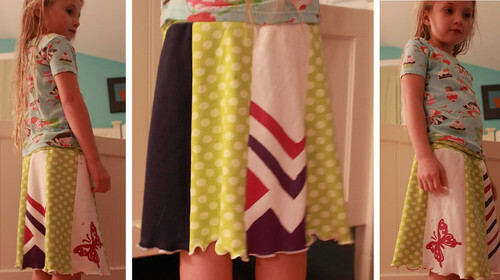 In the 30 minutes I did get, I managed to sew up most of souricette 2’s skirt. Only the hem to finish. And that’s it for KCW for me! I really enjoyed being so productive and focusing on play clothes. Knits don’t intimidate me like they used to anymore. And I didn’t buy any fabric for KCW! Everything came from the stash and I finished up quite a few of my fabrics. It doesn’t look like I used up much when you look at what I have left but I actually feel a little lighter. It reminds me of how much possessions can weigh me down. I just might have to challenge myself to a stash down!